Elinor Stutz learned how to navigate the "old boys network" by focusing on relationship-based selling. Her book, "Nice Girls Do Get the Sale", now in it's second printing and selling worldwide, reveals the power of entrepreneurial thinking to build business. Listen to Elinor's talk at the Circle of Women Conference, and learn how to navigate your business to the next "Smooth Sale." This jam-packed audio seminar details the entire sales cycle in a step-by-step guide on how to build relationships, complete with actual field stories and revealing selling strategies that work. Learn how to: Build credibility and trust; Lead more effective meetings; Get your prospects to confide the challenges they face, and; Close business naturally with repeat business and referrals. 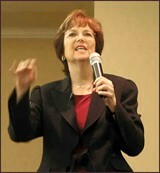 Elinor's passion is captured in action on this DVD of her presentation at the Circle of Women Conference on 8/8/8 in San Mateo.